Watch mom and Fox 5 makes pies for Pie Day. Did you catch Mom's Cranberry Apple Pie make its FEDEX debut on NIGHTLINE Dec 10? 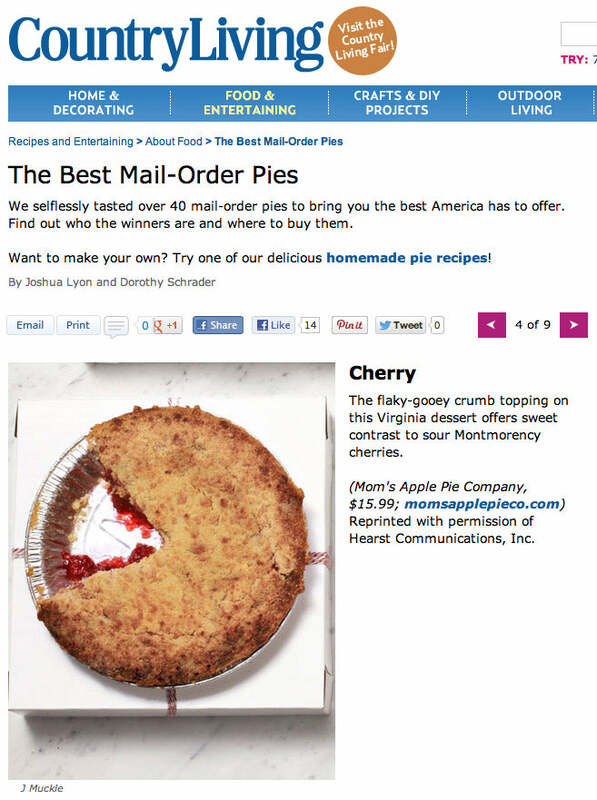 Named one of the 5 best mail order pies by Country Living Magazine, Oct 2010. Featured in Southern Living's The South's Best Pies, June 2010: Avis Renshaw (“Mom” of “Mom’s Apple Pie Company”) makes delicious desserts throughout the year, but her pies really reach their peak in summer when the berries ripen. That’s when Avis offers her blackberry and strawberry specialties made from fruit picked fresh from the farm she owns with her husband, Steven Cox, near Leesburg. She piles berries on top of a cool combination of cream cheese and fruit glaze spread on a thin bottom crust; then she covers everything with more berry glaze. Avis and Steven founded Mom’s in 1981, and now they sell pies whole or by the slice at two Virginia locations.